Okay. It’s true. My dude isn’t quite ready for school just yet. He did recently figure out that toes are delicious. PROGRESS! Most kids though are headed back to school this time of year (or already there) and it can be a serious period of adjustment to get back into the swing of the schedule. Quick meals are a must! 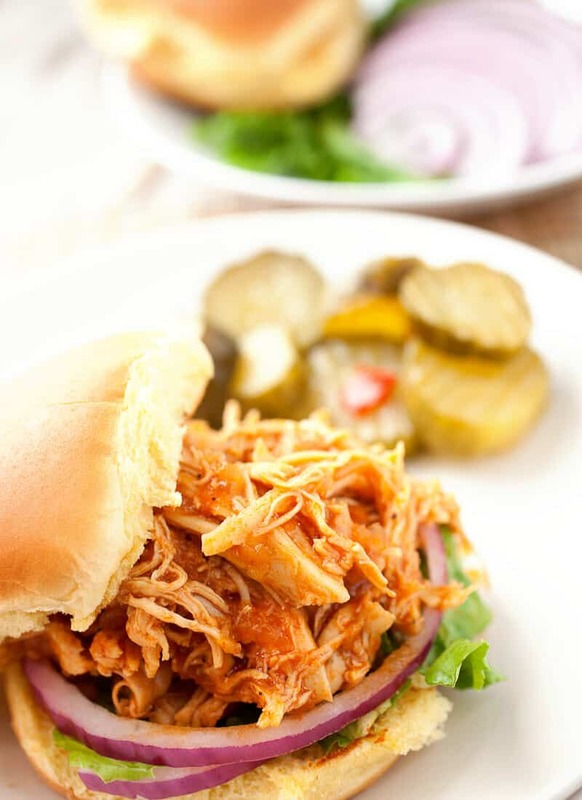 So, say hello to these back-to-school BBQ Chicken Sloppy Joes! 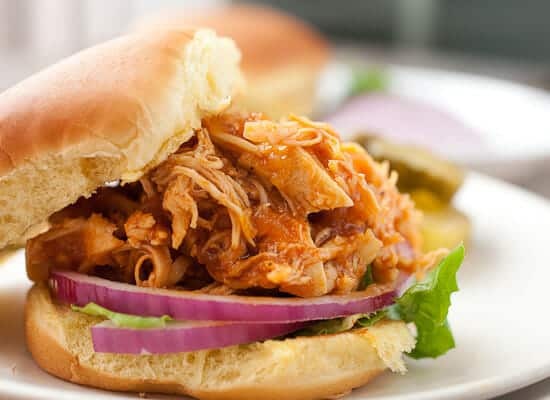 They are a little more work than tossing a package of sloppy joe mix in a pot with some chicken and calling it a day, but the tiny bit of extra effort is well worth it. You’ll still have dinner on the table in under 30 minutes. Super mega promise. 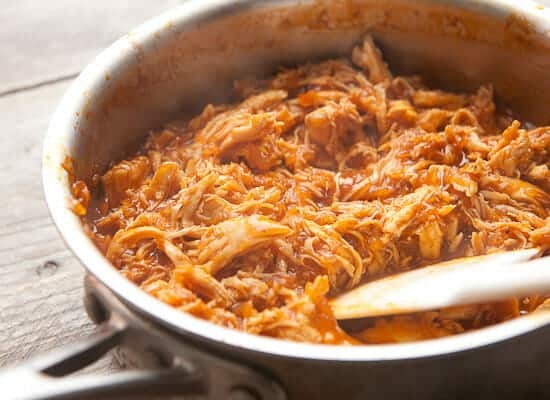 If you’re really crunched for time and a great planner, you can pop all the ingredients in a slow cooker and BBQ chicken sloppy joes will be waiting for you when you need them. The perfect quick weeknight meal. Good for those busy back-to-school nights or any day you’re in need of a quick, filling dinner! 1) In a medium pot, add butter over medium heat. Once melted add grated onion and salt and pepper. Cook for a few minutes until onions are soft. 2) Add BBQ sauce, ketchup, and Worcestershire sauce and stir to combine. Once combined, nestle chicken in the sauce and bring to a simmer. Turn heat down to low, cover the pot, and simmer for 8 minutes. 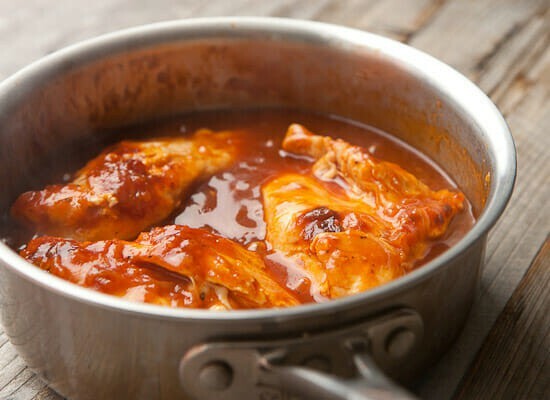 3) Flip chicken in sauce, replace lid, and simmer for another 6 minutes. Test that chicken is cooked through completely. It should very easily shred apart. If it isn’t cooked through, cook for another 4 minutes and check again. 4) When chicken is cooked through, shred all the chicken using two forks. You can shred it very fine or keep it chunkier. Your call. Stir chicken back into sauce. 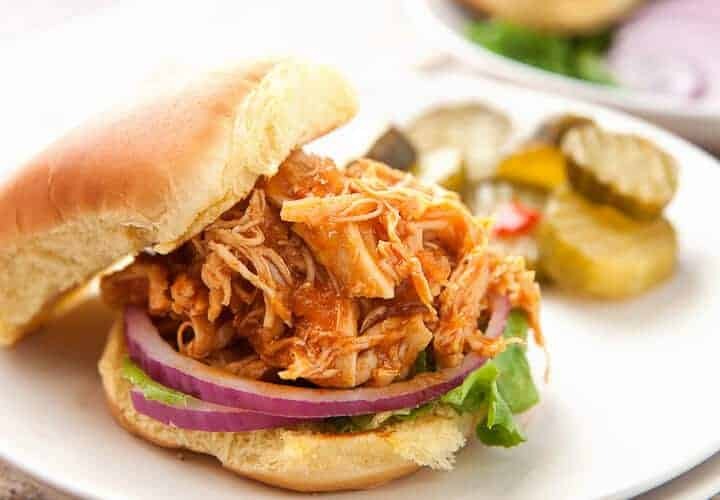 5) Serve chicken sloppy joes on toasted buns with provolone cheese, lettuce, red onions, and pickles. This meal can also be made in a slow cooker. Add all the sauce ingredients and chicken and cook on low for at least 4 hours. Shred chicken and serve! The sauce for these is like a cheater’s BBQ sauce which uses BBQ sauce as one of the ingredients. The finished sauce is a bit more complex though and has some sweetness to it although not as sweet as some sloppy joe mixes which have a lot of sugar. 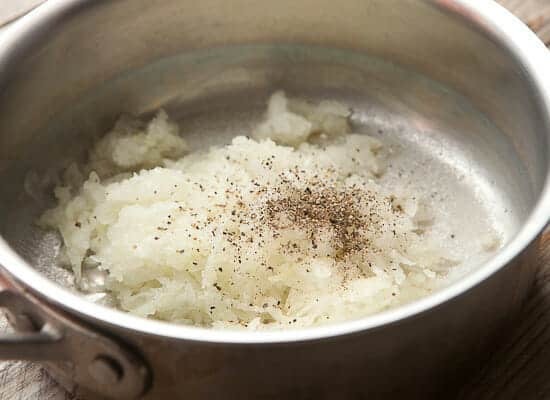 It starts by cooking some grated onion in a little butter (or oil) and seasoning it with salt and pepper. Grating the onion helps it almost dissolve entirely in the sauce. It’s also really the only chopping you have to do so hang in there. 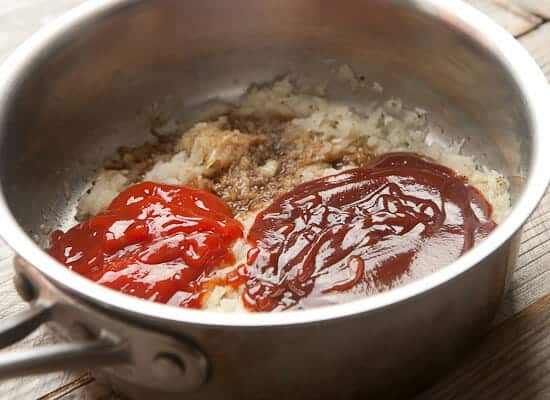 Once the onion is cooked down a bit, add the BBQ sauce, ketchup, and Worcestershire sauce. Easy enough right? Bring that all to a simmer and add the chicken. I used boneless chicken breasts but you could use a mix of breasts and thighs if you wanted. Just kind of nestle the chicken in the sauce. Turn the heat down to low, cover the pot, and let this simmer for about 8 minutes. Then flip the chicken and cook for 6 more minutes. About 15 minutes total should cook the chicken thoroughly. While the chicken is cooking, absolutely get the rest of your sandwich stuff ready: slice onions, wash lettuce, toast buns, etc. You can easily test the chicken by trying to shred a bit of it. It should shred really easily if it’s cooked through. Use two forks to shred the chicken once it’s cooked! You can shred it really finely or leave it kind of chunky. I like it a bit chunky. I just shred it in the actual pot. Not hard! From here dinner is seconds away. Stack some lettuce, and onions on a bun and pile on some chicken sloppy joe mix! As another sandwich option, you can also add a slice of Provolone cheese to the bottom and the chicken mix will melt the cheese! Whether you have little ones headed back to school or you just need a quick and delicious meal, try out these BBQ Chicken Sloppy Joes. I think your whole family will give them an A+. 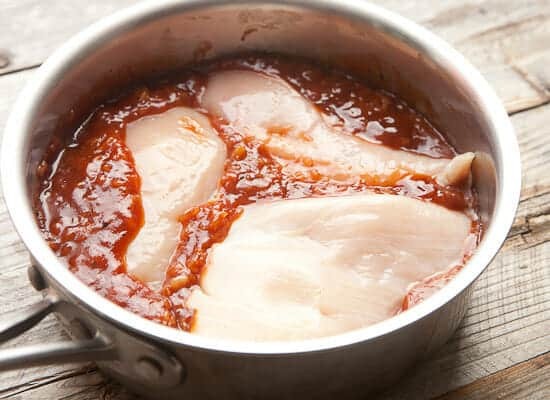 BBQ sauce can be a hit or miss? Any recommendation on brands you like? I’ll bet these would be really easy to adapt to the slow cooker (it’s little league season again, so crock pot meals are a must!). My toddler was obsessed with his toes as a baby–specifically his left big toe. He actually chewed a hole through a pair of footie pajamas at one point. And yes, you can totally just toss all the ingredients in a slow cooker and then shred it before serving! This was amazing! 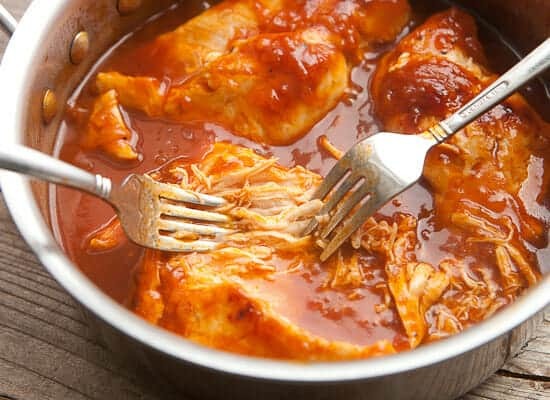 I put it in the slow cooker on low at 8am and by the time dinner came around the chicken was deliciously soft and had soaked up all the BBQ flavours. Served this in home-made focaccia buns with coleslaw – perfect meal for the flatmates. So simple and yummy, and a nice adaptation of pulled pork. Thanks! Simply awesome. Tried it yesterday. Loved it. Thanks for great recipe. I’m a college student and I like to make delicious food for myself and my roommate whenever I have time . I decided to make sloppy joes and using this recipe came out perfect !!! !